Just one day into the qualification tournament preceding Seamaster 2018 ITTF World Tour Lion Japan Open in Kitakyushu and we already have a number of high-profile casualties to bring to your attention including an early exit for Singapore’s Yu Mengyu on Wednesday 6th June. Receiving a BYE in the opening round but Yu Mengyu’s progress was halted in her first contest of the day: she lost out to China’s Hu Limei across five games (11-8, 11-5, 9-11, 11-8, 17-15), who will go on to meet Korea Republic’s Kim Youjin in a play-off match for the main draw. 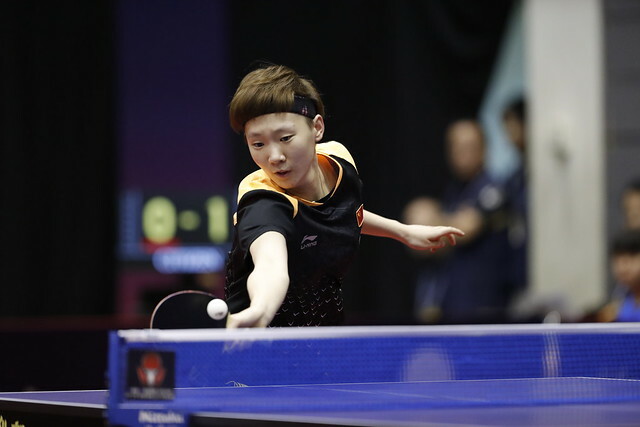 Praised for her impressive display when the ITTF World Tour visited Shenzhen in the previous week, however, Che Xiaoxi’s campaign has lasted for just the one tie in Kitakyushu with Mu Zi getting the better of her fellow Chinese compatriot (11-5, 13-11, 12-10, 9-11, 11-8). The opening day of qualification also marked Adina Diaconu’s elimination from the Women’s Singles tournament with the Romanian competitor suffering an unexpected defeat at the hands of 12-year-old Japanese star Haruna Ojio (13-11, 8-11, 11-7, 11-9, 11-4). The home fans also celebrated victories for Maki Shiomi and Satsuki Odo after they accounted for Nanapat Kola (11-8, 11-5, 11-7, 11-3) and Liu Hsing-Yin (11-3, 11-9, 8-11, 11-13, 11-5, 14-12) respectively. Lim Jonghoon put his name in the spotlight at the recent China Open in Shenzhen, negotiating two days of qualification action before achieving an outstanding semi-finals finish. Once again unseeded, Korea Republic’s Lim Jonghoon began his Men’s Singles campaign in Kitakyushu with a positive outing against Cho Daeseong (6-11, 11-6, 11-8, 11-6, 11-8) to set up a meeting with another of his fellow countrymen Choi Inhyeok. Always one to catch the eye China’s Zhang Jike has started his qualification journey on the right foot, beating Yutaka Matsubara in straight games (11-3, 11-2, 11-3, 11-4) to advance through to the next round and Chen Chien-An will also be happy with his day’s work after the Chinese Taipei representative ended Shunsuke Togami’s hopes of qualifying (11-6, 11-5, 11-7, 10-12, 11-6). Hong Kong’s Ng Pak Nam will play no further part in the Men’s Singles qualification proceedings following his defeat to Zhou Kai (11-4, 12-10, 11-1, 11-2) while Lubomir Pistej failed to capitalise on a two games to one lead, losing out to An Jaehyun across six games (11-4, 6-11, 13-15, 11-6, 11-8, 13-11).